Infrared satellite image of Hurricane Ike as it nears Cuba. 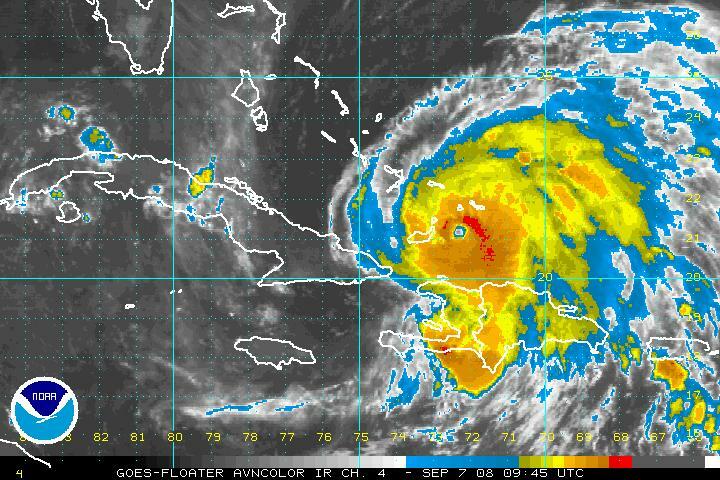 Category 4 Hurricane Ike pummeled the Turks and Caicos Islands Saturday night and Sunday morning with dangerous winds, sea surge and rain as it continues its trek west. At 3:00am MDT the storm was 215 miles east-northeast of Guantanamo Bay, Cuba moving west-southwest at 15 mph. The National Hurricane Center has described this storm as “extremely dangerous” so all countries and interests in the area are keeping a vary close eye on the storm. On its current track the storm will move over the southeastern Bahamas this morning and then onto or near eastern Cuba Sunday night. Latest measurements had the storm with 135 mph and some strengthening is indeed possible before it strikes Cuba. Whether it holds that strength as it passes Cuba will depend on how long it interacts with land. Current models showing it going directly over the island and weaking a bit but it is expected to regain strength as it enters the southeastern Gulf of Mexico. 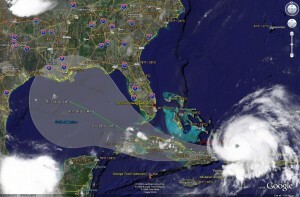 Satellite image of Ike and it's predicted path as of Sunday morning. Click for larger image. It is still much too early to tell what the storm will do once it hits the Gulf of Mexico on Tuesday. Models indicate a potential strike anywhere between Texas and Alabama later in the week. Much can and most likely will change between now and then. This entry was posted on Sunday, September 7th, 2008 at 5:09am MDT and is filed under National Weather. You can follow any responses to this entry through the RSS 2.0 feed. You can skip to the end and leave a response. Pinging is currently not allowed. It would be nice of Ike would just dissipate in the Gulf of Mexico but that of course isn’t likely. Hopefully any damage and loss of life from the storm will be minimal. BTW, great hurricane tracker!